Her finner du en oppgave som handler om forskjellene mellom et arrangert og et tvunget ekteskap. I oppgaven kan du lære mer om hva disse to formene for ekteskap innebærer, og hvilke forskjeller som finnes. 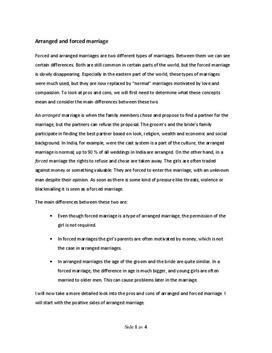 Forced and arranged marriages are two different types of marriages. Between them we can see certain differences. Both are still common in certain parts of the world, but the forced marriage is slowly disappearing. Especially in the eastern part of the world, these types of marriages were much used, but they are now replaced by “normal” marriages motivated by love and compassion. To look at pros and cons, we will first need to determine what these concepts mean and consider the main differences between these two.